Nestled in 192 acres of magnificent rainforest by the sea, this 96-room hotel is located between the Piton Mountains in one of the most awe-inspiring locations in the world. Each of the first class private villa luxury accommodations gives guests the feeling of complete serenity and breathtaking views. All rooms a private plunge pool for refreshment any time, day or night. 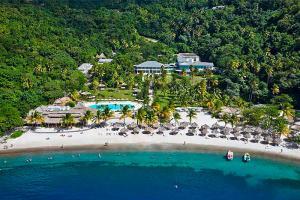 The resort offers water sports as well as a fabulous spa, two fine restaurants and bars. Located approximately 20 miles from Hewanorra International Airport; about 38 miles from George FL Charles Airport. The Verandah Terrace - daily buffet breakfast; Bayside Bar & Grill - themed lunches; The Pier Restaurant - fresh seafood; The Plantation Room - fine dining. Fond Latisab Creole Park, Fond d'Or Nature Historic Park, Diamond Botanical Gardens, Bonne Terre Tropica Gardens, Maria Island, Anse La Raye.